Do you know where its name came from? 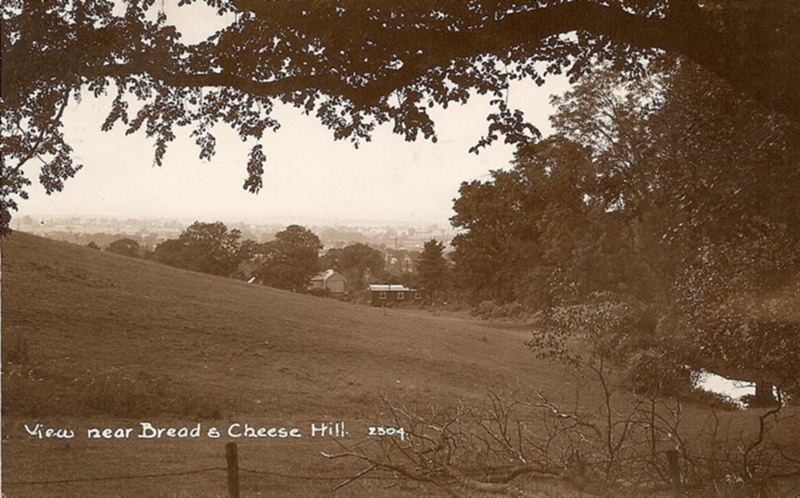 Several ideas have been put forward as to the origin of the name Bread and Cheese Hill, some say that it is due to the shape of the hill resembling a cottage loaf, others disagree. If you have any suggestion as to its origin please add it to the comments. In slippery and snowy weather the hill can become impassable as cars and other vehicles slide down the steep incline. It is not unusual for the hill to be closed by only a light flurry of snow. Bread and Cheese Hill is now a busy road with a constant stream of traffic, very different to these pictures of the 1950’s and earlier. 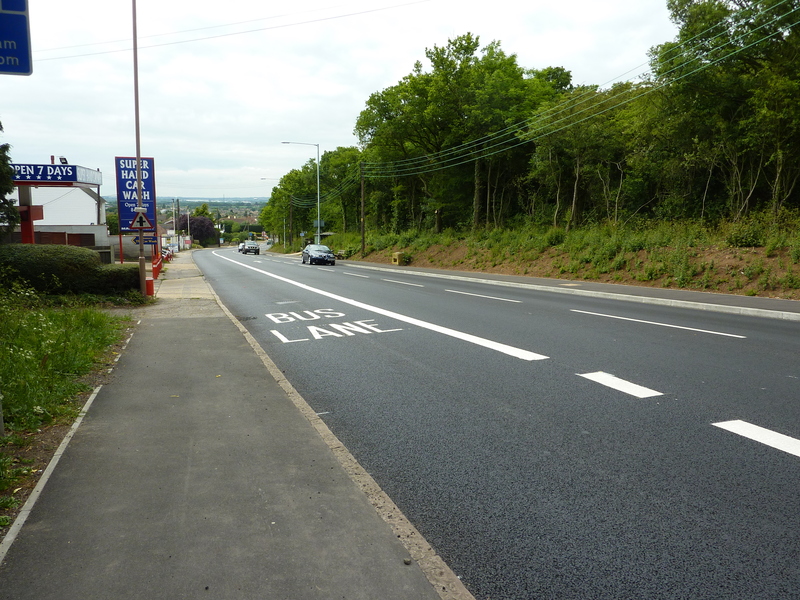 Half way down the hill a new bus lane was installed in May 2011 to ease congestion. Great to see these photos. I was just adding a relative to my family tree and was wondering where the name came from as it said in the census that they were born in Bread and Cheese Hill Sth Benfleet, Thundersley.. so I thank you for sharing. Just a small correction to Mr. Bellamy’s description of the “Green Hill”, it was on the left side going down the hill and not the right. I do not remember the winter of 1947 as I was born in March of that year but a few years later, possibly 1951 – 1954 I do remember the bomb crater you are referring too. We used to call it The Green Hill. It was a challenge when the hill was covered in snow to ride a sledge down the hill and try to jump the crater which was full of water and covered in ice. Well, I nearly made it but as is usual for me I fell a bit short. On that particular day I was wearing a very heavy overcoat which once waterlogged dragged me down into the icy depths. About three feet as I remember but felt like fathoms. I eventually got dragged out and had to walk home (about half a mile) where I received a lovely reception from my mum who said ” serves you bl**dy right.” Boy was I cold. I also remember a boy called Peter Lewis who made a pair of ski’s from two strips of wood and a couple of tobacco tin lids curled up and fixed to the front of the strips but I cannot remember how successful they were. The majority of my childhood was spent in and around that area with my best friend Alan Lewis (now sadly deceased) and of an evening we were allowed to watch the Lewis’s television (my family could not afford one) and I remember watching Tugboat Annie which I really loved. Just writing this has taken me back to my childhood. Does anyone remember the winter of 1947? On the right of the road going down to Tarpots there was a sloping field with a crater. I believe it was caused by a bomb. Well, that winter lots of boys and girls gathered there for sledging. I was there all day and by the time I got home it was getting dark. I’d had no food or drink but must have enjoyed the day. You had to try to miss the crater as it was right in middle of the run down the hill. I did get into a bit trouble with Mum – no mobile phones then and not meany phone boxes or money for them. How would the young of today have managed in those days!! Well I heard it was all to do with Dutch smugglers who used the hill when transporting their booty. It was said that customs men would apprehend anybody looking suspicious, they were asked to say bread and cheese a phrase the Dutch found difficult pronouncing it Bret and sneeze or something similar, straight away giving their identity away. A bit far fetched, but hey. I attended South Benfleet Primary / Junior School in the late ’50’s. A teacher told my class that the name was because the carters used the hill as an opportunity to eat their bait of bread and cheese and also rest their horses. However Bernard Cornwall who I believe was brought up in Thundersley, writes in a note to his Last Kingdom series of books that the name came from the sound of swords hitting shields in a Viking battle near the hill. I was told that the name “Bread and Cheese Hill” was corrupted from the old name of “Broad Chase Hill” – the highway was wide which lends some credence to this. The Winter of 1963 was a cold one with heavy snow and I too can remember getting off the No 3 Bus from Benfleet and trudging up the hill with the other passengers to wait for it at the top. I was raised in Ullswater Road, part of the Plotlands and have yet another theory as to the name of Bread and Cheese Hill. Apparently, The Romans stopped there for lunch back in the time when they were on the march inland. Supposedly, many roman coins etc have been found on the hill. Probably rubbish, but it adds to the mystery of the name. A question for McClane, do you remember Bill Shaw and his horses opposite the old Off-Licence on Church road? Would have been where Martins and the block of flats are now. Bill taught me and my brother Dennis to ride and we got our own pony from him as payment for a debt to my father. Would add a photo if I could but something is preventing me to do so. As a child in the fifties I was told the name came from the taste of the leaves on the trees, don’t recall ever trying though! The very harsh, snowy winter of 1947/48 coincided with my first year at Westcliff High School for Girls. I used to travel on the bus from South Benfleet and vividly remember the bus stopping at the bottom of Bread and Cheese Hill every morning. All the passengers, mostly school children but some adults too, had to get off and trudge up the hill on foot while the bus was driven up empty to wait for us at the top. The same thing happened on the homeward journey. “Health and Safety” to the fore even in those far-off days! We used to live, back in the 50’s, on Manor Road. I heard then that Bread & Cheese Hill got its name in the 17th century when Huguenot refugees from France were stopped there and told to say Bread & Cheese. If they could, and said it properly, they were allowed to proceed. If not, they were turned back, on the grounds that they were taking English jobs from English workers. My mum, Pauline Tookey (was Edmondson), says she always thought Bread and Cheese Hill was so called because of the hawthorn bushes along the road. Apparently another name for the Hawthorn is the ‘Bread and Cheese tree’ – the leaves and buds can be eaten from the tree, and tea can also be made from the flower buds. When my sister and I were little (late 50s, early 60s) my parents used to whizz down Bread and Cheese Hill on their bikes with me on the cross bar of my dad’s bike, and my sister in the seat on the back of my mum’s. Great fun then, but wouldn’t want to do it now! I was born in a bunglalow in Bread and Cheese Hill in 1937. My dad, Frank Henry Perry, used to keep ducks, and I remember a photo of him leading them down to the pond. Alas! I cannot find the photo now. Our neighbours were my uncle Bert Card and aunty Amy. 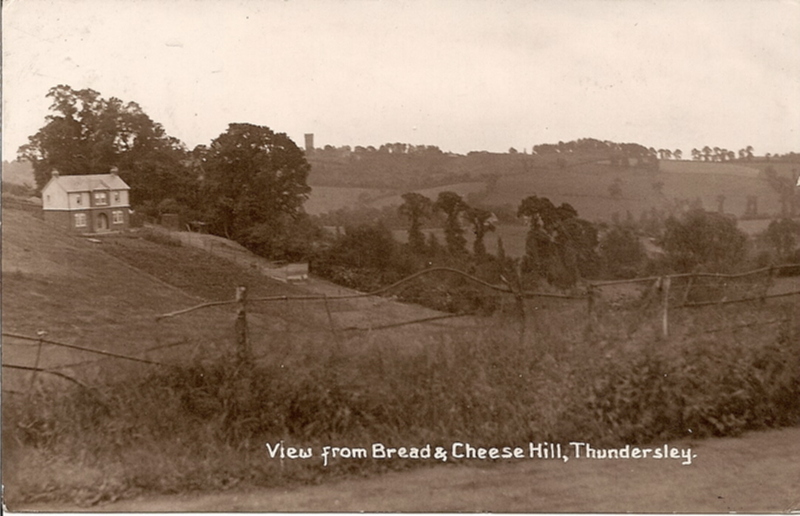 My parents told me it was called “Bread and Cheese hill “Because by the time the driver of a horse and cart had reached the top they needed a break and pulled out their bag of bread and cheese and a bottle of cold tea. Thanks, Frederick for the answer re the name of the hill, a question I asked Phil Coley at the Castle Point show. Catherine, the van incident reminded me of the late 50s when our family mode of transport was often an Austin A40 van with a very bouncy suspension, its normal use was bread deliveries for the family bakery firm. On one occasion my Dad was taking my sister and a friend to a Girls Life Brigade event, in the back of the van. He took a sharp corner on Canvey and sister Jenny ended up seated and stuck in an empty bread basket from which she had to be extricated (plus breadcrumbs) on arrival. Thank you for your comments, they really add life and interest to the web pages. New members are welcome to join the Archive and if you have other memories of Benfleet either add your own page or drop us an email. I hope you are happy in your new home. I have been reading articles about Benfleet with great interest. I remember travelling along London Rd, Bread & Cheese hill as a child. We always seemed to break down there and just as one gentleman said lots of people would get out their sandwiches and eat Bread & Cheese until they got their vehicle going again. I am moving to South Benfleet soon after living for many years in London where I was born & raised. I want to be a part of the community and have been reading about it and visiting many parts. Once when I was about 5yrs old I travelled to Southend with my family in the back of my Brothers old van. Mum & Dad sat in the seats and I had a cushion and sat in the back playing with my toys. As the car began to climb the steep Bread & Cheese hill I fell against the back doors and flew out landing in the road!! 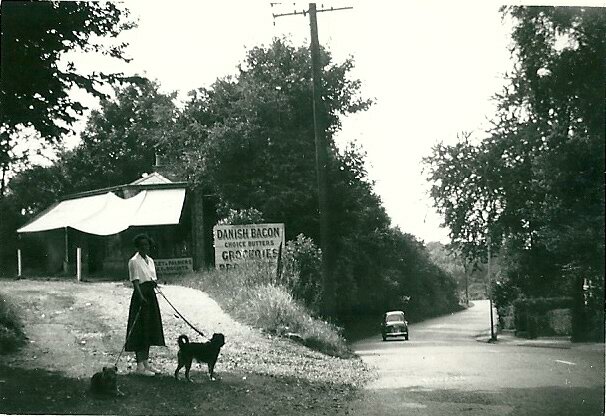 In those days there wasn’t much traffic and we have often laughed about it since. But imagine how I laughed when recently I saw that the road at the spot near where I fell out of the van has been named Catherine Road!! My name is Catherine. I hope that’s an omen that I will be welcome in Benfleet and spend more happy years in my new home. 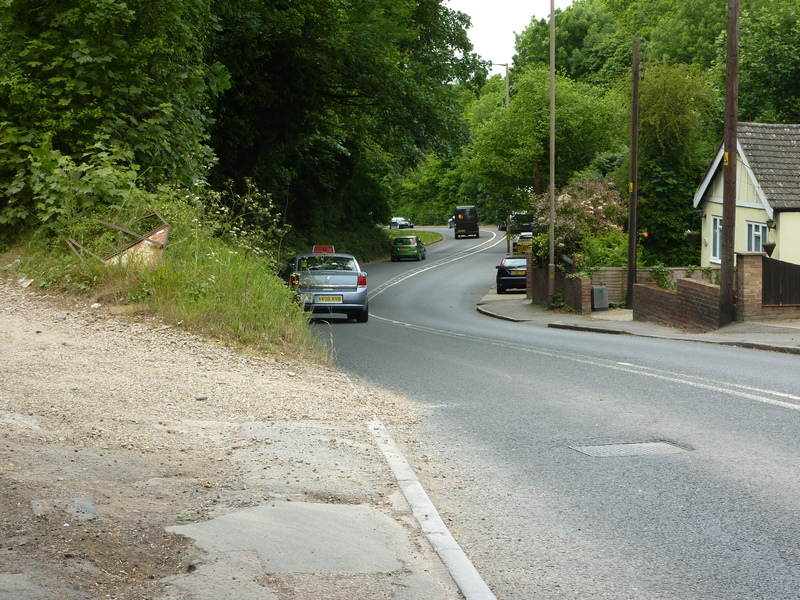 Bread and cheese hill is about 1.5km in road distance – that’s a long hill in Essex!. The hill got its name in the Edwardian era when motorcars on the way to Southend-on-Sea would boil over by the time they reached the brow of the hill. The chauffeurs and their passengers would eat their bread and cheese lunch while the car engines cooled. It was not long before a hostelry (which still survives) was opened to take advantage of the trade, so that is how the name came about. My brother Alan’s comment above is correct. The house is called Crescent House and is located in Mount Crescent. The caption on the postcard is incorrect. Our relatives have lived in this property for many years, it is situated at the top of the Devil Steps. 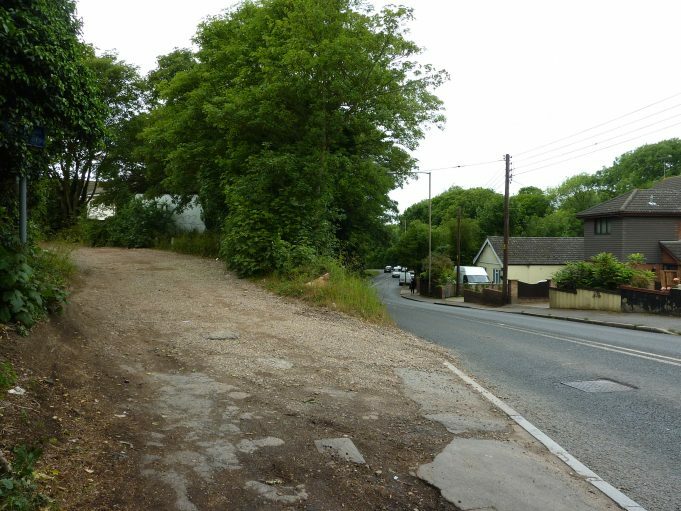 I have an article on this site under ‘areas’ headed Hill Road and in the last picture shown you can see this house. I believe this photo was taken from outside Jarvis Hall and you can actually see the same view today, albeit during the summer months the trees partly obscure the full view. I would dispute that the second picture from last is a view from Bread and Cheese Hill. My opinion is that this picture was taken from the top of Thundersley Park Road (Jarvis Hall vicinity) looking across Boyce Hill Golf Course to the water tower at the top of Essex Way. The house on the left belongs to my cousin which is situated in Mount Road.